But then I read somewhere what a Meyer lemon actually IS: a cross between a lemon and tangerine/mandarin orange. Like a pluot (plum-apricot.) Now that’s a game changer my friends. I apologize to all food bloggers and cooks everywhere whose Meyer lemon recipes I brushed aside. Now I’m on the bandwagon. Meyer lemons be rockin the house. They are sweeter than a lemon, but you still of course can’t just bite into one. They serve just as lemons would most of the time, but with a tangerine-y citrus flavor that I’m kind of failing at describing right now. Just trust me you guys, it’s delicious. I’m dying to try it as regular lemonade, like this Meyer Lemonade from White on Rice Couple. (Except I would probably add basil because didn’t we just talk about how I’m obsessed?) I feel like most of the time you see Meyers in desserts, but you can definitely get creative on the savory side too. 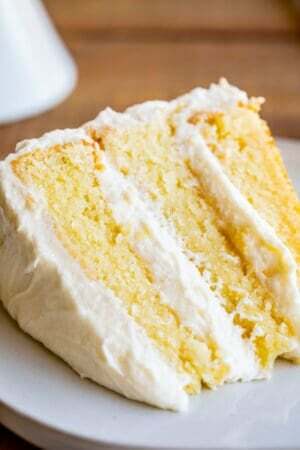 See the bottom of the post for some Meyer lemon recipe links. Don’t fret if your crepes look like a bloody train wreck on the first couple tries flipping. It takes some practice. If your crepe turns out looking fabulous on the first try, then head to Vegas, because you have an awesome case of beginners luck. Honestly it doesn’t matter much what they look like because you are folding or rolling them anyway. Oh, and don’t be freaked out by the cardamom. I promise it’s delicious. Cardamom and lemon, sittin in a tree. 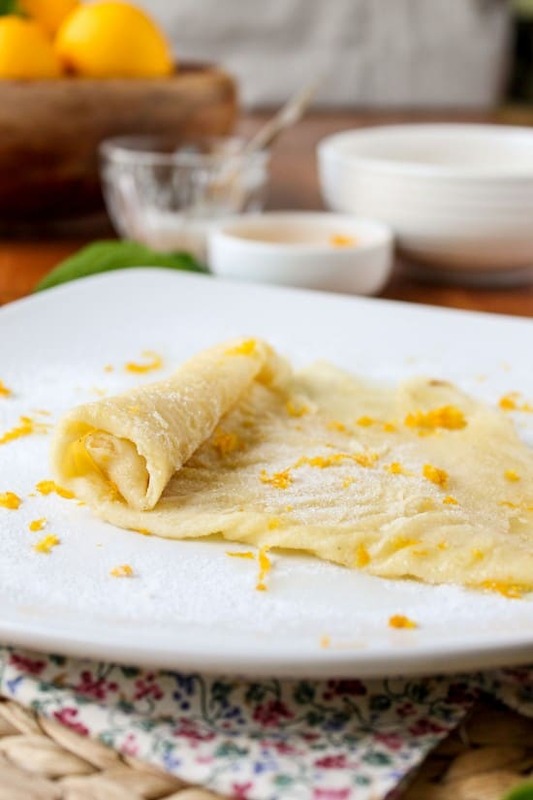 K-I-S-S-I-N-G. First comes love, then comes marriage… These Meyer Lemon and Cardamom Crepes would be a nice recipe to change it up for Mother’s Day on Sunday. What are you guys doing? My mom and I are going on a local Garden Tour. That’s right, we are actually paying to walk around a hoity-toity neighborhood and feel jealous of other people’s fake waterfalls and overly manicured lawns. Then we will go back home and cry over our scrawny tomato plants and barely-surviving crabgrass. And then we will stuff our faces with these crepes, and everything will be better. In a large bowl or stand mixer, whisk together the flour, sugar, salt, cardamom, and meyer lemon zest. Gradually add the milk while whisking. Get out all the lumps. Add the eggs, vanilla, lemon juice and melted butter, and whisk for a couple minutes. Heat a large skillet over medium heat. When it is hot, brush some melted butter on the bottom of the pan. Pour 1/4 to 1/3 cup of crepe batter into the pan. 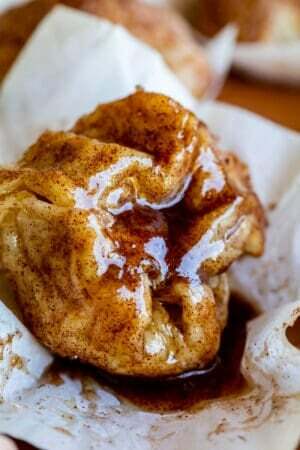 Quickly lift the pan with your hand and rotate it so that the batter swirls around to coat the bottom of the pan. You want a very thin layer. Here's a good crepe video. Cook for about 1 minute, until the top of the crepe is mostly dry. Then carefully flip with a large spatula. Cook for another 15-45 seconds. Some brown spots are okay, but don't overcook them or the edges will get crusty. Repeat with the rest of the batter. You can remove the crepes to a plate and then cover them with foil to keep warm. 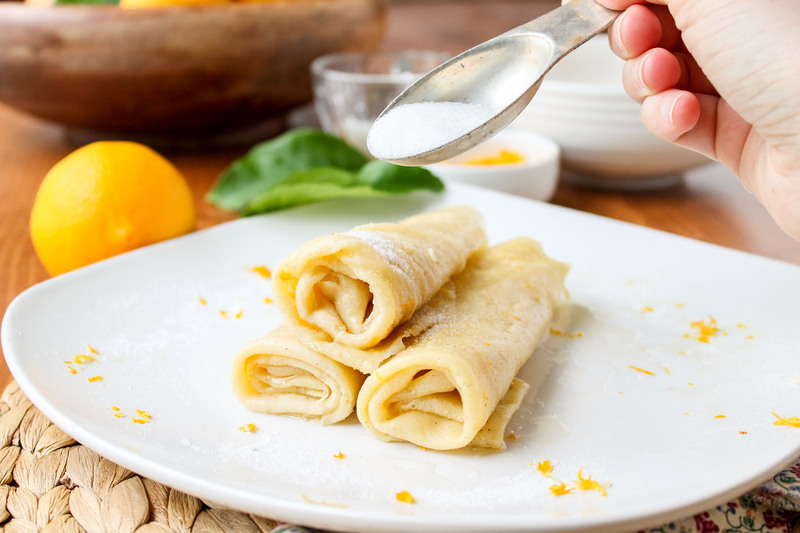 To serve, lay a warm crepe flat on a plate and brush generously with warm Meyer lemon juice. 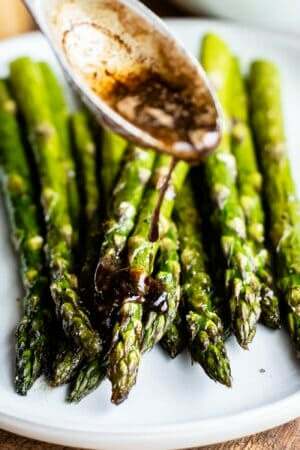 Sprinkle with 1-3 tablespoons sugar. Top with a sprinkling of zest. 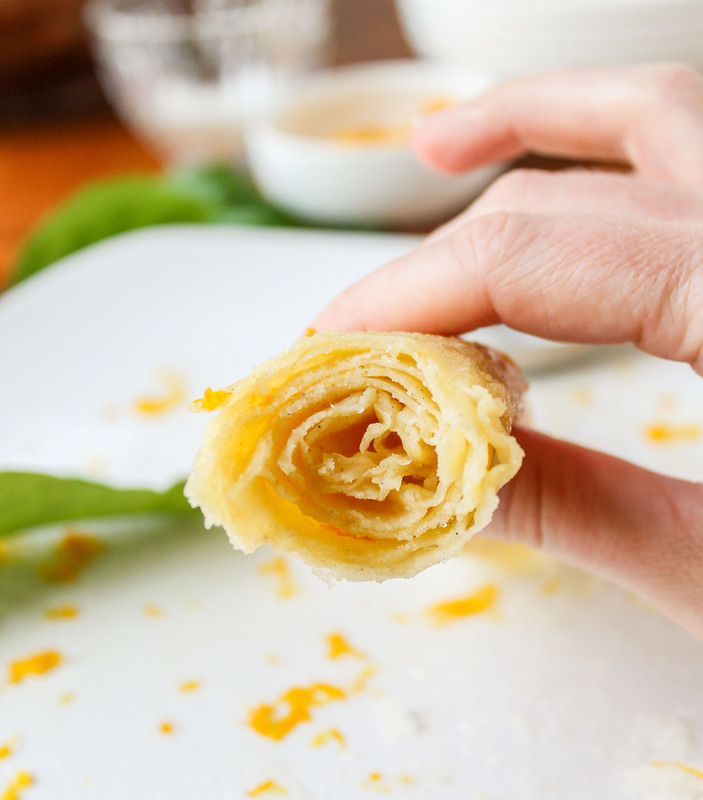 Then either fold the crepe into quarters or roll it. I folded mine in half, then rolled. 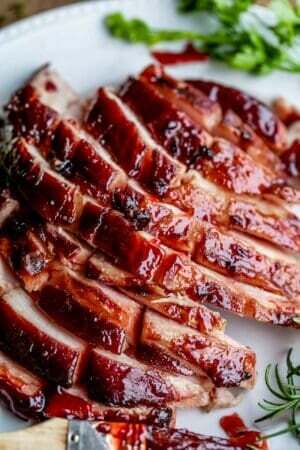 Top with additional juice, sugar, and zest. I know I've been going on about the Meyer lemons, but regular lemons will still taste fabulous in this recipe. 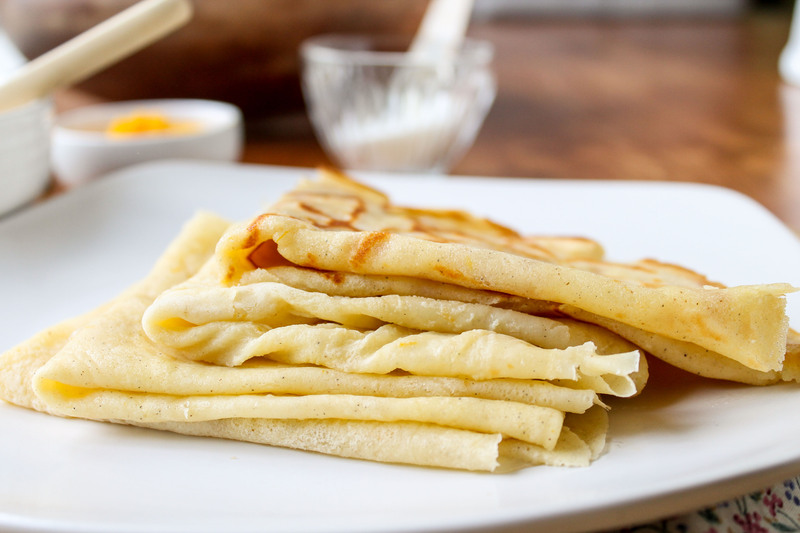 You can fold your crepes however you like. I like to fold it in half, add toppings, then roll. I love that you can see the specks of cardamom. CardaMOM. See I told you this was perfect for Mother’s Day. Okay Karen, here’s your sign. Time to shut up. I actually mix all of my crepes in a blender, it works great and are easy to pour out of. I also let mine rest for 30 minutes, I don’t remember the exact reason (I think texture, it’s be long enough I forgot why 😂), but I think with something like this with cardamom it’ll help the flavor marry. To everyone who if just to frightened to make crepes, do it! Just trust me, it’s way scarier than it is hard! Yes, some (maybe most) will come out ugly… Who cares? They’ll taste just as lovely ugly as they would if they were pretty. My first 4 or so always look HORRIBLE, but I eat them anyway. I avoided them for a long time thinking they were super hard, and when I took the least I the first time I was like…”huh, that’s it?” You can do it, you really can. 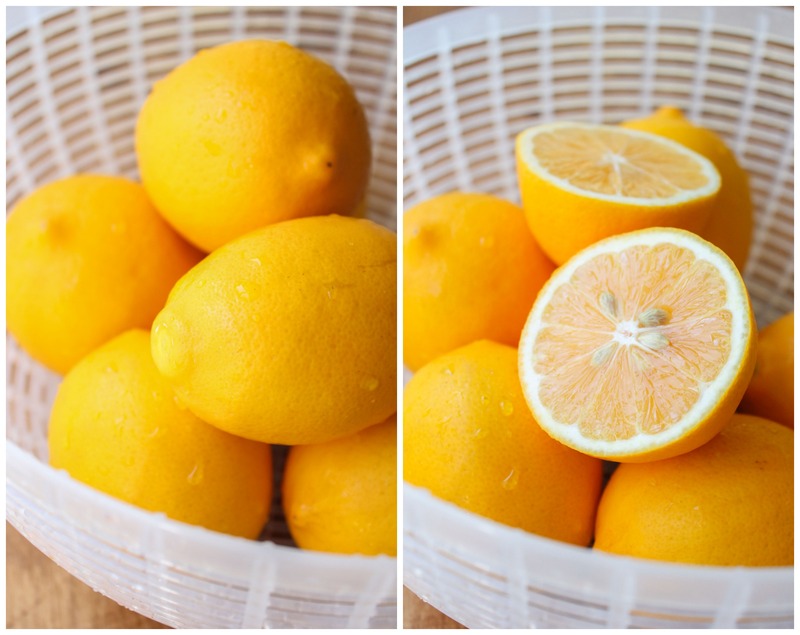 For people looking for Meyer lemon, be aware they often look different from batch to batch, I usually have to give the labels a look to make sure, because the ones we get in AK look just slightly smooth lemons, you’d easily pass them up. I’ve never found the super pretty Orangey colored ones. I over looked them for years thinking they were just lemons. Oops! Well, you have convinced me about Meyer Lemons! I didn’t really realize they were all that different from regular lemons! Plus the color is so pretty – I need to get some! Your crepes look so perfect. I love the flavors that you used in them! Love crepes, but never thought of adding cardamom. These look magnificent! Um yes, if your first crepe looks good . . . you’re some kind of magician. I think I end up with one decent-looking crepe for every 30 crappy ones. I love the taste, but I hate making them haha. Also, I’ve never seen a Meyer Lemon. Ever. Anywhere. I’m going to go cry now. Because they sound AMAZING! I feel so uneducated right now…I’m pretty sure I’ve been eating Meyer lemons from my backyard and didn’t even realize it until now. It’s a rental so I didn’t plant it but I was wondering why they tasted somewhat like an orange. Hmmph! Welcome aboard the meyer lemon band wagon! Aren’t they fabulous? I love these crepes! The lemon and cardamom combo is so unique. 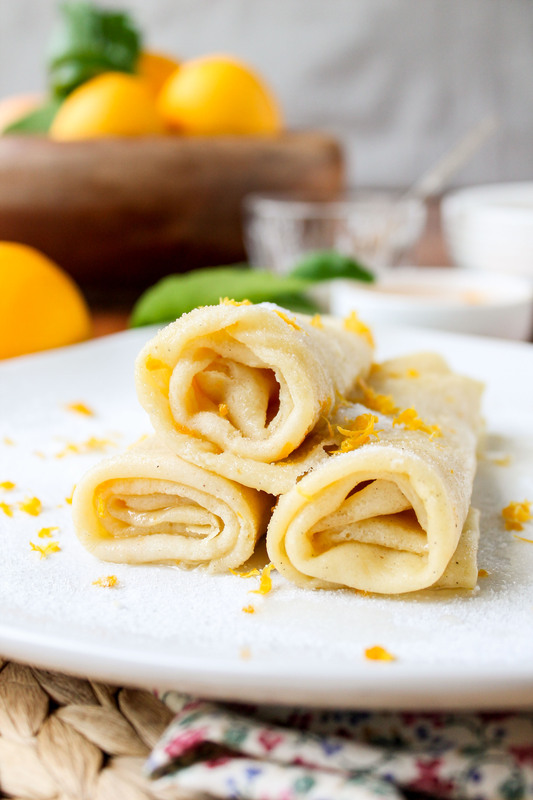 Crepes are definitely one of my favorite breakfast treats, can’t wait to try them out! Pinned! I am extremely disheartened that I have not jumped on the meyer lemon bandwagon yet, but I think that you are just so adorable and amazing with words that I must go to the market RIGHT NOW! If i wasn’t so terrified of making a crepe, I’d be making them ASAP. Maybe I will have to give it a shot this weekend ;). Thank you so much for sharing! Pinned times a million! Hehe I love your writing style..so witty and hilarious ;). I absolutely adore meyer lemons..and plots and all the fun-named hybrids. I’m so impressed by your crepe making skills! They look perfectly thin and light. 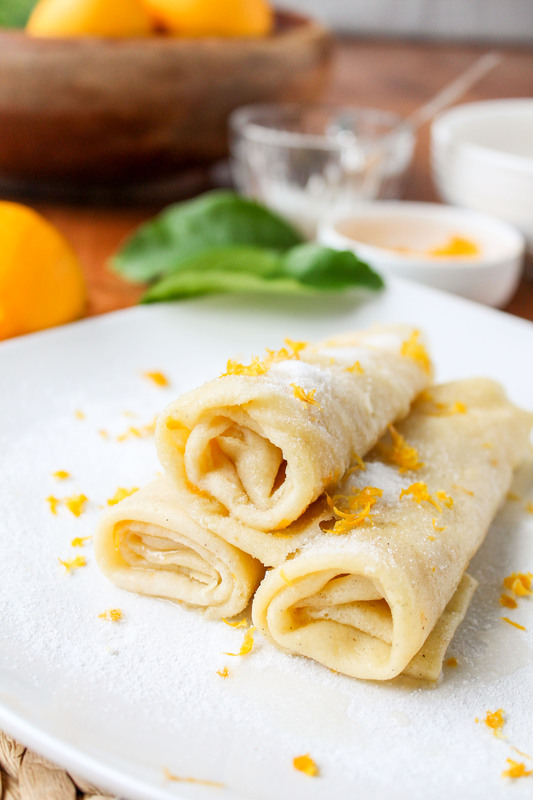 Meyer lemon + cardamom – love the way you roll! Hope you had a wonderful mother’s day! My husband makes crepes during Conference, every six months. (Yes. I got a winner.) But usually he just sprinkles jello powder over them. I might just casually mention this blog post in passing and see what happens. Fingers crossed. Wow!! Don’t these look so beautiful and delicious!! YUM! I love that you made them lemon flavored! Perfect for Spring time! 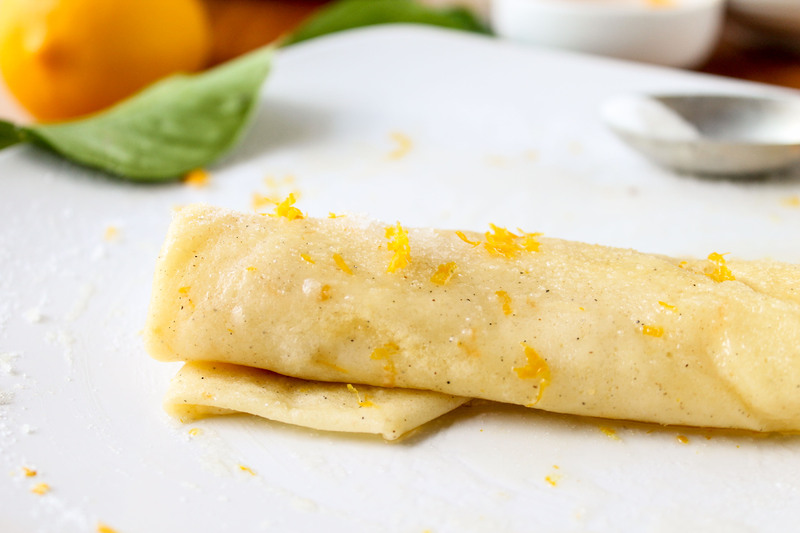 Meyer lemon crepes with cardamon? Sign me up! These look super fresh and zesty…and amazing. 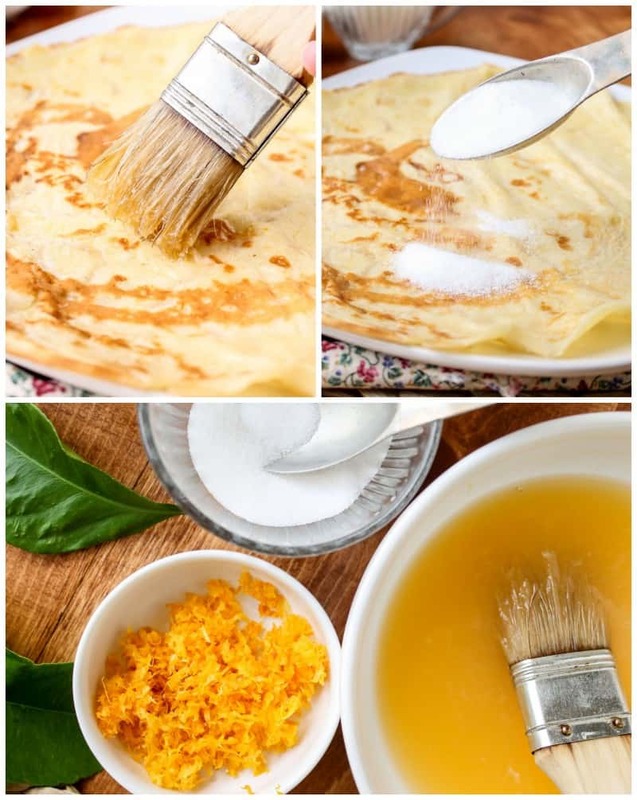 Although I must admit I’m terrified of making crepes…mine have looked like bloody train wrecks more than a couple times….but, what the heck, I’m gonna give these a try! Yum! Love those bright yellow little orbs! I could sit there and sniff a Meyer lemon all day (exaggeration, but still). Also, cardamom is a perfect fit for it–so warm for that bright tang! Oh crepes. How I love. These look fantabulous. I’m kind of obsessed with cardamom. We live off of crepes every weekend! Thanks to hubs :) He’s the crepe man in our house. This is such a great combo though. Will have to try! Hand raised here. 2 hands actually, love crepes. And with this lemon flavoring? Forget about it. These look amazing! Hope you have a great Mother’s Day weekend. Karen, these look great. I am sure you could also fill these with many great ingredients. 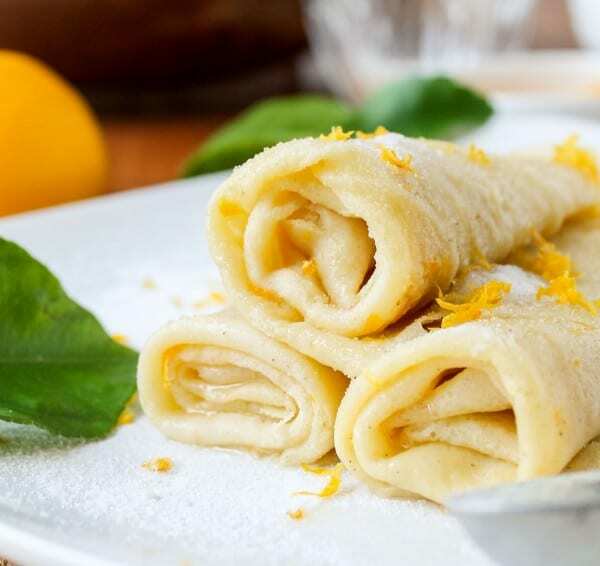 These crepes look wonderful, what a great combination. Love cardamom and lemon together, a match made in heaven. These look delicious! I finally was able to find Meyer lemons in a store near me. Now what to make…possibly these. Thank you so much Amy! That means a lot coming from you, your blog is so awesome. I hope you had a wonderful Mother’s Day too! Mine was great. Lots of food :) And yes, I really was awake at publication time for this post BECAUSE I’M INSANE. I don’t write posts when my kids are awake, so that means I usually finish around 1 or 2…or 3. Bad, bad. someday it’s going to catch up to me. until then I’m just going to lay on the foundation underneath my eyes, lol! Aww you’re so sweet — thank you! 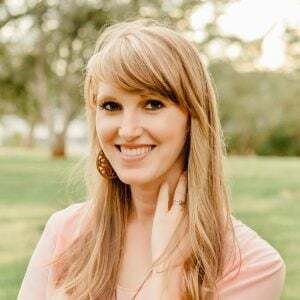 :) You’re a great mom to wait to write blog posts until your kids go to bed! They might not express it very well now, but when they grow up they’ll definitely appreciate the time and attention you gave them instead. And I was awake when you posted it too, so shame on me! I don’t even have kids to blame it on! ;) My guy’s nocturnal, not just a night owl, so even though I’m a morning person, I try to stay up late to spend quality time with him. Oof, hand me that foundation!